“‘Have you ever been out for a walk, minding your own business, and then out of nowhere a dog rushes out and starts barking at you…What did you feel like?’ My heart rate jumped, breathing grew shallow, and I felt great fear. It was an automatic and immediate response, requiring no thought on my part, an uncomfortable feeling as well. She sighed and said, ‘I feel like that all the time.’” Just as one of Dr. David Morgan’s patients describes in his book, all of us experience anxiety to varying degrees. 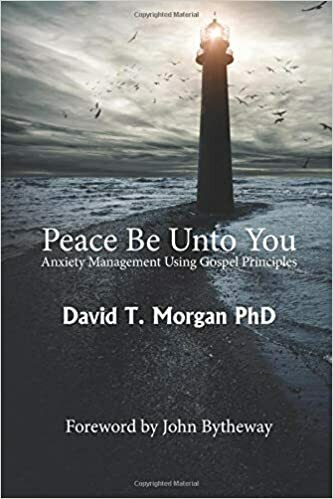 Whether you feel anxiety all of the time, or occasionally when stressful situations arise, there’s something to learn in his new book, Peace Be Unto You: anxiety management through gospel principles. With anecdotes from years of practice as a psychologist, stories from the scriptures, and powerful life metaphors, Dr. Morgan delivers an insightful look into human psychology and how we can overcome anxiety through thought work and trusting in God. He gives specific insight and counsel in how to deal with anxious feelings, how to overcome the obstacles anxiety creates, and how to help those you love deal with anxiety. This book will give you specific, applicable tools, both psychological and spiritual, and immediately lift your spirit and give you hope that you can conquer any anxiety in your life. In eleven thoughtful chapters, Dr. Morgan teaches that anxiety is a part of life that we should expect to experience, but that we are in control and can develop personal power through the Atonement of Jesus Christ. He creates a case study from the book of Jacob in the Book of Mormon, showing through a close reading that this powerful prophet suffered from anxiety, while identifying how he overcame his difficulties. Dr. Morgan teaches psychological tools such as mindfulness, visualization, thought work, and coping strategies that offer immediate solutions readers can apply to their lives, as well as teaching how feelings of love and confidence can empower those who struggle with anxiety. Finally, he offers guidance to those who want to help others suffering from anxiety, offering profound wisdom from his years of experience in the field. Dr. Morgan’s psychological expertise, combined with his mastery of the doctrine of Jesus Christ, make him the ideal mentor for anyone who wants to learn how to understand anxiety and its purpose in our progress in life. David T. Morgan is a licensed psychologist with more than twenty years of experience in the mental health field. He has a BS in psychology, an MS in counseling and guidance, and a PhD in counseling psychology from Brigham Young University. He and his amazing wife are the parents of six children. David loves the scriptures and truly believes the answers to life’s challenges can be found in the words of ancient and modern prophets. He also loves Disneyland and knows almost more about the Happiest Place on Earth than he does about psychology.